Ectomycorrhizal (ECM) fungi have a worldwide distribution. However, the ecology of tropical ECM fungi is poorly documented, limiting our understanding of the symbiotic associations between tropical plants and fungi. 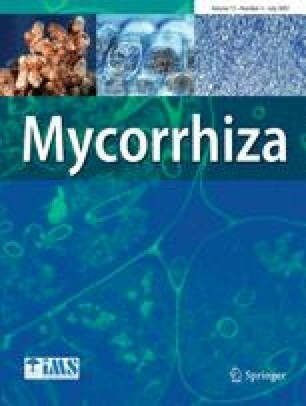 ECM Basidiomycete diversity was investigated for the first time in two tropical rain forests in Africa (Western Upper Guinea) and in Asia (Western Ghats, India), using a fragment of the mitochondrial large subunit rRNA gene to type 140 sporocarps and 54 ectomycorrhizas. To evaluate taxonomic diversity, phylogenetic analyses were performed, and 40 sequences included from identified European specimens were used as taxonomic benchmarks. Five clades were recovered corresponding to six taxonomic groups: boletoids, sclerodermatoids, russuloids, thelephoroids, and a clade grouping the Amanitaceae and Tricholomataceae families. Our results revealed that the Russulaceae species display a great diversity with several putative new species, especially in Guinea. Other taxonomic issues at family/section levels are also briefly discussed. This study provides preliminary insights into taxonomic diversity, ECM status, and biogeographic patterns of ECM fungi in tropical two rain forest ecosystems, which appear to be as diverse as in temperate and boreal forests. We thank P. Deschères, G. Ifono (Eaux et Forêts, Guinée), A. Fontana (IRD, Guinée) for their help in identifying several tree species. We thank Dr. V. Kumaresan (CASB, India) for fruitful collaboration. The authors are grateful to Dr. D. McKey (CNRS, France) and Dr. O. Dangles (IRD, France) for useful comments, discussion, and support. This work was supported by a doctoral grant from the French Institute of Pondicherry to Taiana Rivière.